Description: Humans have long been afraid and distrustful of vampires. A young vampire named Allistaire, who is also part human, wants to change that. His family has been living among humans for hundreds of years and they have always used their abilities for good. One day, while reading his favorite super-hero comic, Allistaire decides that he’s going to do everything he can to help humans. 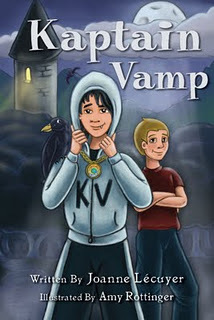 He enlists the aid of his best friend to help him become Kaptain Vamp. My Thoughts: This was a short novel with profuse illustrations. Allistaire is a young vampire with a human best friend. Allistaire wants to convince people that vampires can be helpful. To do that, he and Rich create an alter ego - Kaptain Vamp - and the two go around doing good deeds. Allistaire's first good deed involves helping a young boy who has fallen down a cliff and broken his arm. Fortunately, his mother is a doctor and had taught all the kids first aid skills. Of course, he also has his super strength and jumping ability to help him with the rescue. The problems the kids solve are real life ones including stopping the school bullies from preying on younger kids. The illustrations add to the story too. I liked the various full-color illustrations that decorated the book. I also liked the additional touch of magic that the necklace from Allistaire's grandfather gave him. It lets him wish himself into and out of his Kaptain Vamp costume when he needs to be Kaptain Vamp. The story was a good one about friendship and the satisfaction that comes from doing good deeds. I think this would appeal to upper elementary students who are interested in vampires but aren't ready for anything scary. Allistaire and his friends giggled. Allistaire believed that science was important and he was determined to someday find a way to use it to help humans. I received this book from the author for review. You can buy a copy here. What's on the Review Stack?